My free Wedding Budget Worksheet provides a comprehensive listing of the items you may want to consider when planning your wedding. The spreadsheet contains a wedding budget estimator tool that lets you specify your allowable budget amount, and then adjust the percentage of the budget you want to allocate to the various categories, such as apparel, reception, flowers etc. 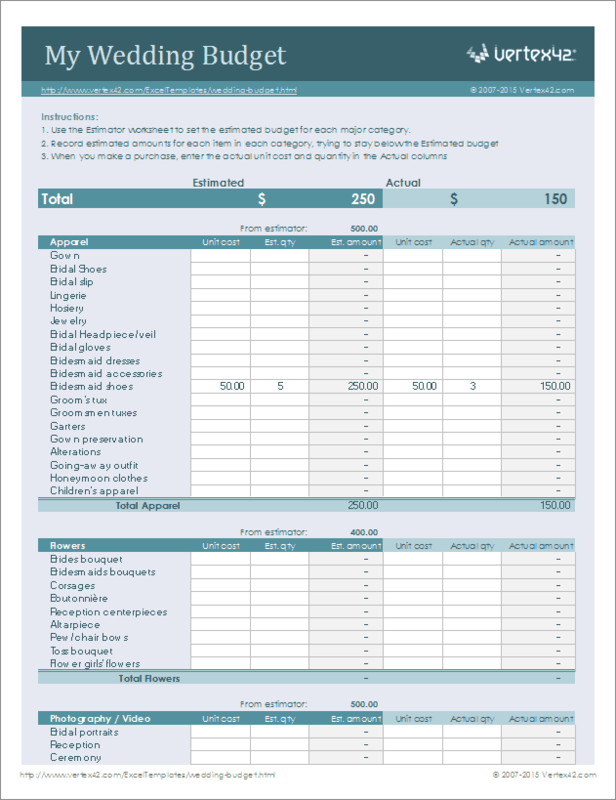 The wedding budget worksheet can be opened in almost any major spreadsheet program, but you can also download the printable wedding budget planner. Check out the printable wedding checklist as well. If you don't want to use a spreadsheet or don't have access to a spreadsheet program, you can use this printable worksheet to help plan your wedding. The only downside is that the calculations won't be automatic, and you won't be able to add, change, or delete categories or items from the worksheet. You can now download a new version of the wedding budget template that lets you enter unit costs and quantities for each item. All the categories are the same, but this version is a bit easier to use. Need help planning your wedding on a budget? Download the wedding budget spreadsheet to plan and keep track of your expenses. 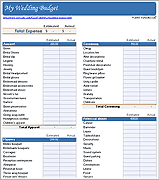 The file contains two worksheets ... one for creating your detailed budget, and one for coming up with an intial estimate or plan. (view the screenshots). Use the estimator worksheet to get a rough idea of what percent of your budget to spend on different categories, and then dive into the details. Update 5/29/2014 - We've updated the percentages in the wedding budget estimator to conform more closely with industry norms (the screenshot to the left still shows the old numbers). 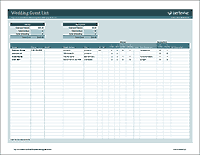 You can also create a wedding budget using our Google Sheets version. How Do I Plan a Wedding on a Budget? Wedding Checklist - by Vertex42.com - This checklist contains the same categories and items listed in the wedding budget spreadsheet. Disclaimer: We believe the calculations in the wedding budget worksheet to be correct, but do not guarantee the results. If you modify the worksheet, you may end up with errors. 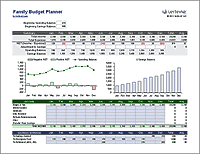 The weddinb budget template and the information on this page should not be taken as financial advice.